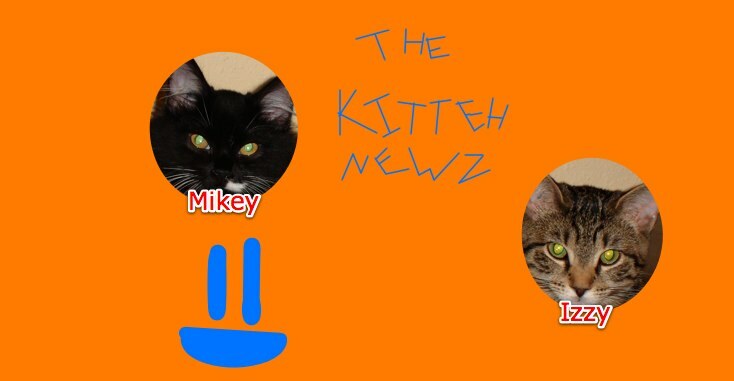 The Kitteh Newz: Fun Pictures + Catmas Facts! Mikey and Izzy currently have the most presents under the Christmas tree. Mikey likes stealing gifts from under the tree. We're getting a new couch! Woohoo! There are ten gifts under our tree: one for M&I's Grameow, seven for Mikey and Izzy, one for just Izzy, and one for just Mikey. There are four stockings on the wall: mine, Grameow's, Mikey's, and Izzy's. I have made many Catmas-colored toys for my fuzzy babies - I made a red and green candy cane-shaped pipe cleaner toy that Izzy adores. Maybe I should start telling you about these photos. On top is Izzy looking out the window. Next is Mikey asking for belly rubs. The third one: Mikey's got his dangle toy. Fourth, Mikeymikes is sitting on his food mat. Next, there's my Mikey baby, stealing some beads from my jewelry table. And the most important of all: MERRY CATMAS, DOGMAS, FERRETMAS, OR WHATEVER YOU CELEBRATE! Hey, in the comments section, tell me what you're celebrating! Catmas, Dogmas, Ferretmas, Birdmas, Fishmas, etc.! I love all of the photos! You two seem like a lot of fun! I just wanted to tell you that I celebrate Catmas, just like you do. Merry Catmas! I hope to see what you get. thx grameow. yep me n mikey is very fun. merry catmas.